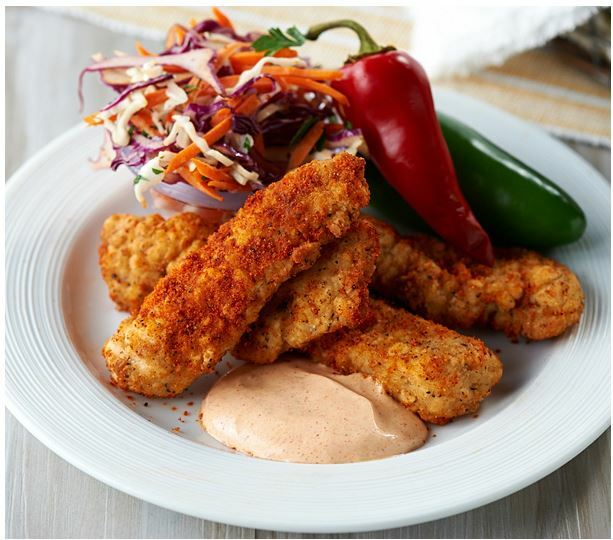 Our Chicken Fried Chicken Strips are breaded with an original southern buttermilk recipe, then are fully cooked. Ready to just heat and eat, they will make a perfect, protein packed main entree or quick appetizer for friends. These strips are fully cooked and can be reheated in the oven, microwave or air fryer. Conventional Oven: Preheat oven to 350 F. Remove desired number of pieces from packaging, place on a a sheet pan lined with foil and sprayed with a non-stick spray. Bake for approximately 20 minutes, or until internal temperature reaches 165 F measured using a meat thermometer, turn chicken after 10 minutes. For a crispier crust cook product on a baking rack. Air Fryer: Preheat to 390 F for 8 minutes, place desired number of pieces in basket (do not stack product) cook for approximately 6 minutes or until meat thermometer reaches 165F.